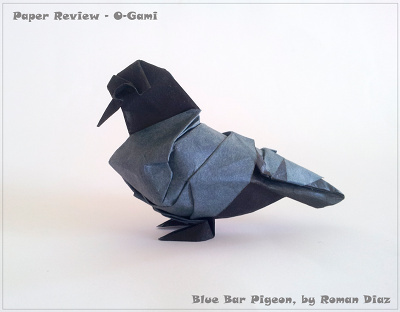 There is a first for everything, and this review is the first one "made to order". 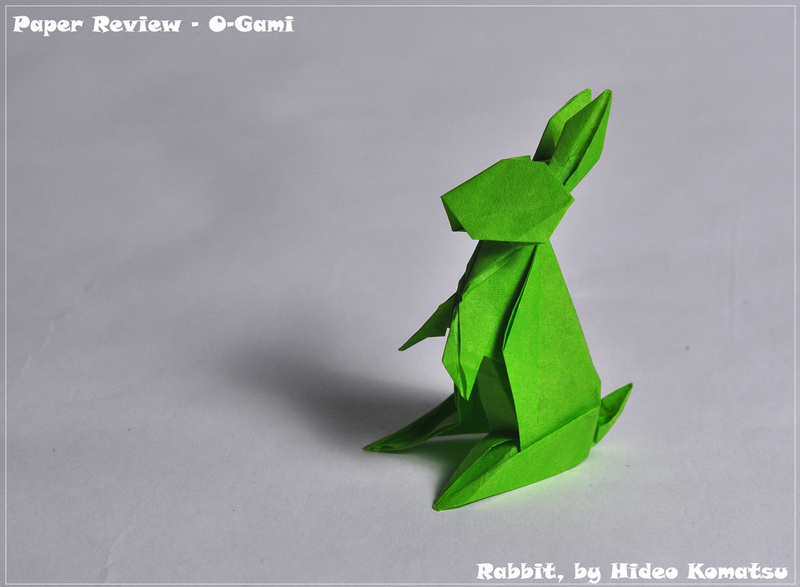 O-Gami, a brand name of Paper Circle, asked to review their paper. 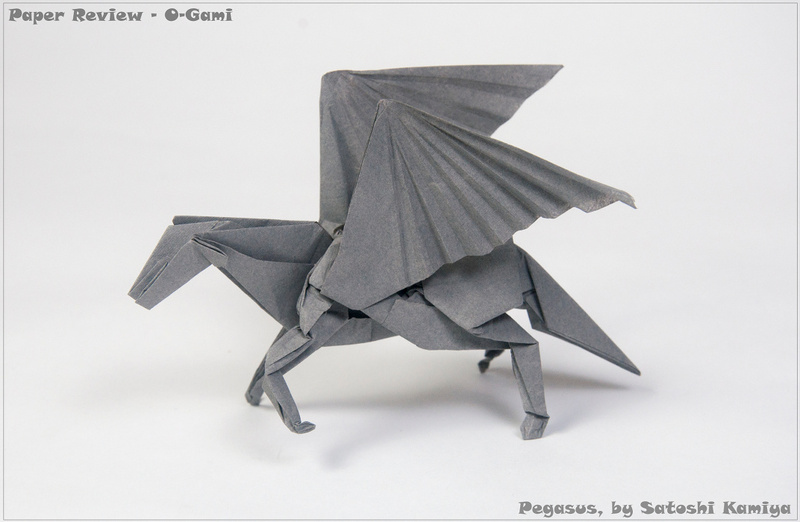 Truth be told, O-Gami paper was on our shortlist of papers to review already, together with many new and exciting Japanese papers. The request helped us decide to review it next. 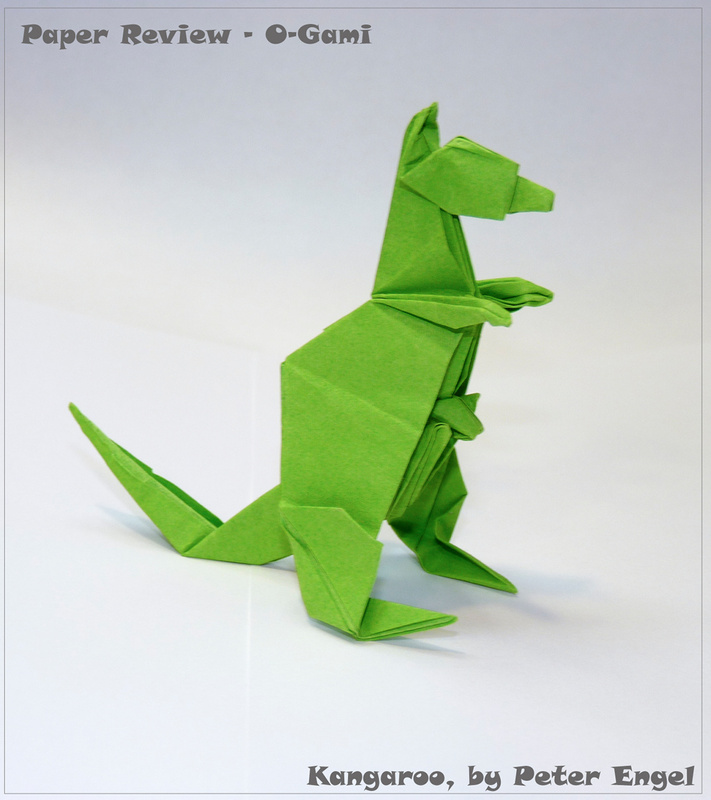 For sure, we cannot ignore a paper which by definition is made for origami, in particular for complex projects. Paper Circle's website provides data and images of the handmade production process. They use abaca fibers, high quality pigments and no acid. All this is done with us origami enthusiasts in mind. As always, we buy our papers. As soon as the package arrived I gave Gadi some sheets and we sat down to choose the models to fold. 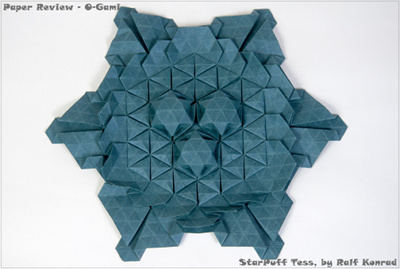 We decided to test only 3D figurative, complex models, and, of course, tessellations. This paper is not really designed for modulars, simple models or action models. Now, usually we do not state who folded which model, but this time our opinions differed greatly. So we decided to split the review into sections of who tested the paper. As Gadi and I have two very different opinions - Gadi didn't like the paper at all while I just loved it - we were happy to get a third opinion from Ynon Toledano. Thickness: We tested two weights of this paper: super thin and medium. The producer states that the medium paper weighs 68 gsm, whereas the super thin weighs 23gsm. My measurements were quite different. The super thin gray paper was 21gsm and the green one was 28gsm. The medium blue paper was 97gsm, while the green was 74gsm - both more than the stated weight. The thickness I measured was 110 microns for the medium blue; 100 microns for the medium green; 50 microns for the super thin green and only 25 microns for the super thin gray. As with all handmade papers, these numbers vary from sheet to sheet. Sizes: There's only one size in stock: 22in × 28in (559mm × 711mm). 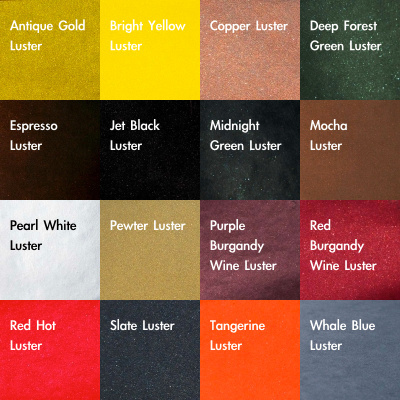 Colors: 16 colors are available for each the Luster and the Matte. As the Mottled is made ad hoc, the offer is ever-changing. Paper Coloring or Colorability: I chose the super thin green paper to test the colorability. When using acrylic metallic red paint by FolkArt the paper got almost no ripples or curls. Drying is a quick process, it only took a few minutes. Strangely, there was a change in proportions - a 14cm × 14cm square turned into 14.3cm × 14.1cm; since there is no fiber direction in a handmade paper, I assumed the change in both directions will be the same. The color seeped through to the other side easily. Texture: Three different textures are available, but we checked only two: Luster and Matte. The third, Mottled, is made out of a blend of colors. All have a rough surface. The Luster has a beautiful glimmer, as the manufacturer adds luminous pigments to enhance the color with an organic, wet-looking sheen. All sheets have the classic look of a handmade paper with the fibers swimming all over. 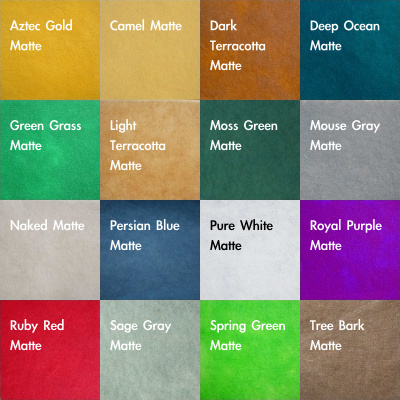 Photogenic: With many colors and a rich, interesting textures, this is a paper for modelling. I found it hard to catch the glimmer of the blue paper, but still I like what I got. Aging and Wear and Tear: This is the toughest paper we've tested thus far. The tear machine gave results up to 2100 (for the medium papers). In comparison, Elephant Hide scored 1100, and Lokta 2000. Made out of pure abaca, abaca with flax, or abaca with hemp this paper promises to last long, withstanding the rigors of complex, repetitive folds, and water for wet-folding. 10 out of 10. Memory: Stronger than usual. This is more evident with the medium paper, but the super thin papers also have a very good memory. 9.5 out of 10. Forgiveness: This property, as may be obvious, gets better with thickness. The thinnest papers are far from easy, but the rest are much better; somewhere between very good to excellent. 7 and 9 out of 10. Tensile Strength: We refer here to the maximum stress the paper can undergo while being stretched or pulled. As has happened before with handmade papers, the machine could not complete this test. The long fibers keep this paper from snapping when it is stretched, avoiding the machine from detecting the moment of measurement. 9.5 out of 10. Bending Resistance: This section rates the amount of force you need to apply to get a sharp crease and how strong the paper is while being curved. Since the test machine is in repair, I have no numbers here but a sense of my hand. The medium papers are highly resistant when folded. A bone folder is almost a must. 9 out of 10. The super thin papers are more welcoming, but they are far from being soft, even given their low weight. 7 out of 10. Price group: Very expensive: for very special projects, such as exhibition pieces. You wouldn't buy this paper for just a simple crane. So instead I folded this lovely, flat butterfly from it. It went perfectly well. So while the test results for complex models and tessellations are more interesting, this model shows that you can also achieve beautiful results when folding simple models from it. The first impression I had when folding a 26 by 26 grid was of stiffness - in a very good way. The paper breaks marvellously and it is so easy to reverse creases when preparing the grid. I felt no difference between vertical and horizontal creases. This is common with handmade paper, since there is no evident grain direction. But for tessellation, the main test lies in collapsing the pattern. 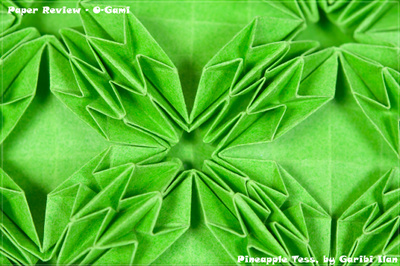 O-Gami paper scored very high in that test. The stiffness leads to the paper snapping into place during the first stage of collapsing. This continues even in the second, more demanding stage of collapsing. Ideally, the paper should stay in the same position when collapsing one molecule after the other. Most papers don't manage this, but O-Gami does almost completely. I finished the model in a shorter time than usual and I am very happy with the final look of the model. Due to it being handmade, parts of a sheet may be too thick. The thickness of the paper varies dramatically, both from sheet to sheet, as well as within one sheet. Although this sheet has the same stated thickness as the green one, in reality it feels much thicker, like it belongs into a different weight category. As to the variation within one sheet: you have to use a lot of power to crease the thicker parts if you want to get sharp creases. There is no way you can slide the edge around until you get it right. If you bend the paper before folding, it will break too early. One must be very accurate with it, and work slowly. The thinner parts, though, worked perfectly. During the collapse the thickness is not an issue anymore and it went very quickly, as the fold lines are crisp and strong. Finally, puffing up the stars worked nicely, too. All in all, the paper is highly suitable for the model. The thinness of this paper can be a bonus and an obstacle with this model. I chose the green, super thin paper. Making the base gave a very strong and good first impression; the paper is thin, but strong and crispy. Reversing and sinking went easily, and the general feeling is of a high-end paper. The paper is thin, yet highly responsive. Still, since it's handmade, some areas are too thin. I noticed this especially when trying to fold the talons, which include sink folds, and with the wings. In the thicker sections of the paper both worked beautifully, but the thin sections of the paper are too soft to be sunk easily. The same goes with the breast feathers. I had to try too often to get them into the right place and the paper turned too soft to handle. Yet the thinness of the paper made shaping the talons much easier. You can easily add fine details. Here I used the gray, super thin paper. It is the thinnest in the pack and I could fold it with ease. Reversing, though, is not as easy, and you must concentrate to stay on the crease line. The open/closed sink (step 37) was almost too much for the paper, but with slow and determined hands, I managed to make it. It became obvious how thin this paper is when I could easily crimp the tail, which consists of 16 layers. And it pays off in other parts of the model, too. It's easy to complete the dense crimps required for the wings and shaping the hooves. Plus, the paper is so strong in relation to its weight that the hooves can actually hold it without breaking aside. 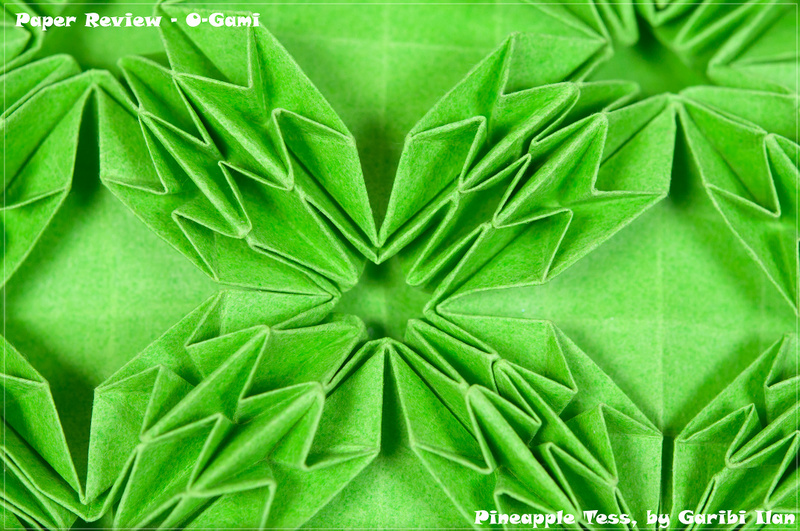 This is a problem I've had with most other papers - but not with O-Gami! 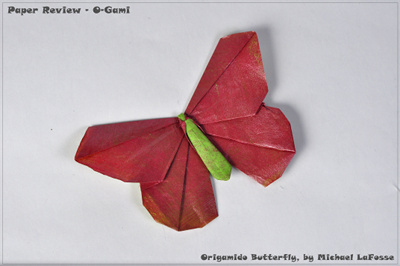 The thin paper can hold a 3D shape. When using the super thin paper you don't need bigger paper than this. I didn't take a single break while folding this model and finished it quickly. Most of the time I found the paper easy to handle. Even folding the ears, which requires a multi-layer squash fold, did not slow me down. The 3D phase didn't suffer from the thinness and I managed to shape the body as I wanted it. The strong bending resistance holds the body in place. I chose the blue, medium paper, to profit from the benefits of the high bending resistance it has. That came with a price - the folds are hard to make and I had to use a bone folder. Moreover, when folding four or more layers in one, it's almost impossible to avoid the layers from drifting apart. I managed it, but only with much effort. In the final 3D stages the good sides of the medium thickness paper comes out - the body holds the shape easily and the lock, which is based on the forces created from the curved folds, works perfectly. Good for wet folding, too. 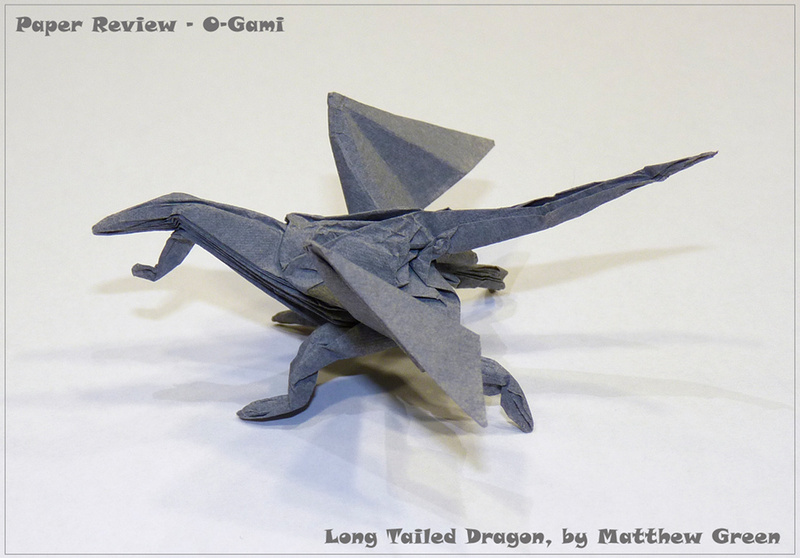 The numbers suggest that O-Gami is too thin for wet folding. Still, the paper feels like it is much thicker, sturdier paper, so I also tested wetfolding. I used a nasal spray bottle. The paper absorbs the water nicely and the paper becomes easy to handle. I shaped as necessary, re-sprayed, and left the finished model to dry. As expected, the paper hold its new shape firmly. The surface also did not curl in the process. This paper is much too weak, at that size. I tried to get the facial details with the dwarf, with no success. The fibers broke and the paper became too soft. When folding the paper the crease lines aren't very strong, so trying to reverse them is hard. As with the dwarf, the paper is too weak at this size. The lion requires much pre-creasing and the paper is not suitable for that. This is a complex model that asks for many small details. The first steps went well, as the paper manage to hold all creases nicely. The main problem was getting the final details - I couldn't do it! 17 cm is a small size for most folders, but I usually manage to complete the model. Not in this case! The legs are too weak. The paper holds the creases very well. It is easy to reverse fold lines. But in order to make the fold lines more accurate, I had to refolding creases often, making the paper too soft. The paper was too thick to easily make the final adjustments. Still, the final model is very strong and stable. Simple, sturdy model worked well for Gadi. I only had problems with the neck due to its many layers. The rest, however, went smoothly, a real joy to fold. 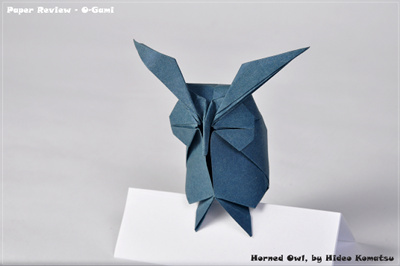 This model has little layers, and asks for curves and smooth lines, which makes it a perfect model for this paper. This paper is very strong, and as such, there was no need to strengthen it. The paper is well behaved with folding, although reversing them may be problematic. All in all, a very good paper that I enjoy folding with. As you can see, our young expert enjoyed this paper! The super thin paper is great for complex models, but I found it hard to shape the small details. I think it might be the perfect paper for insects. Coloring the paper enhanced its folding qualities. I colored the blue paper, and only one layer was needed. The medium paper is very good for simple models. So, a conflict. This is when it pays off to have an odd number of judges. During the review we argue a lot, which led to a retrial; more models to fold. Unfortunately, our positions stayed the same: Gadi didn't approve and I did. 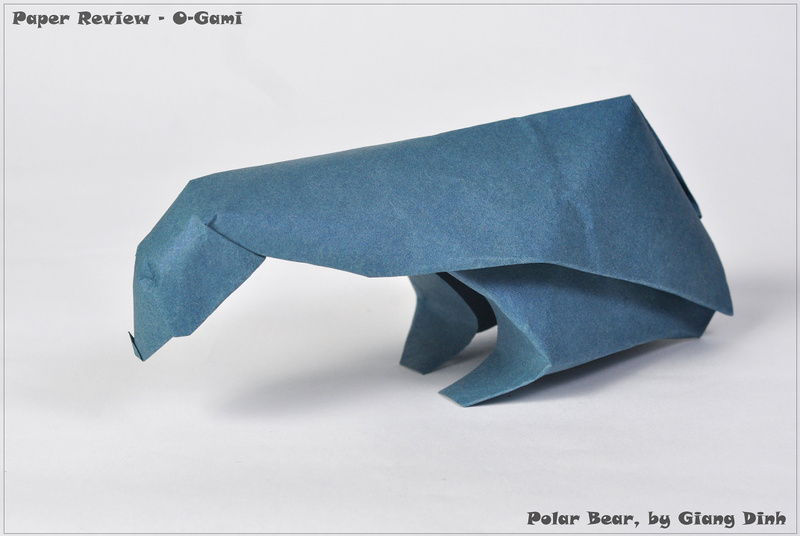 I guess some of it is due to the fact that Gadi is a micro-folder; he likes to fold in a small scale, and at that size the paper behaves differently. His main problem was that the super thin paper was too soft. Still, this paper is strong, very strong, can take a fold, snap into place when needed. And of the three reviewers, two of us really, really like it. I found it very good for tessellation and complex models. The medium paper is highly suitable for intermediate, 3D models, and is very suitable for coloring, as well as wet folding. The super thin paper, especially if treated, is highly suitable for complex models. Mostly for its strength and beauty. As far as I know this is the only handmade paper specifically made for origami, which is at the same time sold online (unlike Origamido). If you are a beginner, this may be the perfect answer for your needs. It's a strong paper, folds easily, keeps creases very well and reverse folds are very accurate. 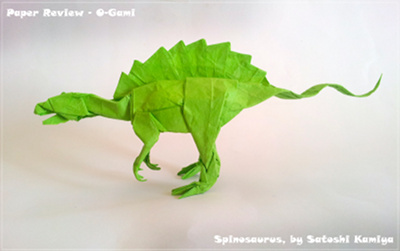 On flickr, I found 150 images of models folded from O-Gami; all but two are complex models - insects, dinosaurs and figures. The other two were tessellations. Some of the remarks from the folders declared their love for this paper and its quality. Bottom line: strength and beauty!